If you’re a content marketing practitioner, manager, or director in anything beyond a very small organization, at some point you’re going to be asked to justify all this content. The best way to do so is with an actual ROI calculation. It’s important to note here that when I say ROI, I mean ROI, which is an abbreviation of “return on investment.” What ROI is and how it is calculated mathematically isn’t a point of debate. It is a formula, the same way converting fahrenheit to celsius is a formula. Now, you may be unable—or unwilling, or even afraid—to calculate your actual return on investment for a particular content initiative. In that circumstance, you might select to use instead some other “success metric” or KPI, an acronym for “key performance indicator.” But, if you are not calculating ROI per se, don’t call your preferred performance measures ROI. First, know that you should measure content marketing ROI at the initiative/campaign/program level. You can calculate the ROI of your blog. You can calculate the ROI of your webinar series, etc. Once you calculate the ROI of your specific programs, you can roll all that data together to figure your overall content marketing ROI across the entire business, if you like. 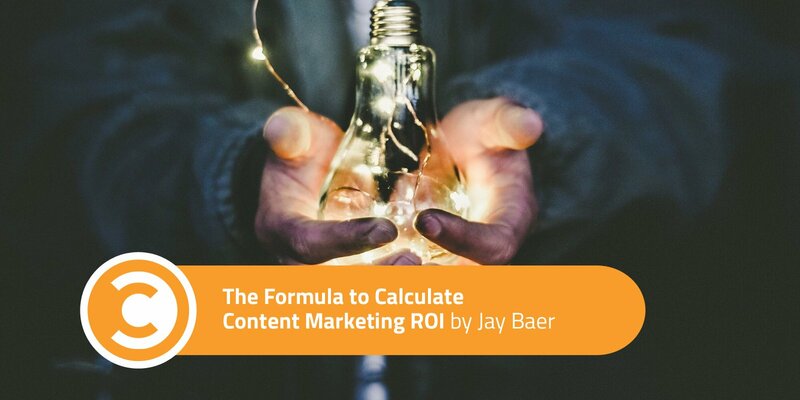 To measure ROI, you have to know, in as much detail as possible, the R (return) and the I (investment) of your content initiative. Let’s say you run a commercial fireworks business that sells shells (by the sea shore) to producers of fireworks shows. It’s a highly targeted, B2B business with moderate competition, and quite a bit of seasonality. As a genius content marketer, you know you need to create awareness among your high-value audiences, and that you further need to use content to create “hand raisers”—potential customers that will trade their personal information for access to content. You decide to use a podcast as the door opener, and an ebook as the data collection magnet. The podcast is called The Fireworks Files. It’s a twice-monthly video podcast available on your website, YouTube, and iTunes. Each episode interviews one of the country’s leading fireworks show producers (your customers and potential customers). The show is hosted by Billy “Bang” Bangerson, your Director of Sales. In each episode, Billy promotes the company’s “Fireworks Tips and Tricks” ebook, downloadable from a landing page in exchange for email address, and some other information. This whole endeavor requires a fair bit of work. The question you need to answer is whether it’s worth it. Here’s how. Between prep and recording, Billy spends three hours per show. Billy’s pay rate is $100/hour. Add a 50 percent overhead factor on top of that to cover office space, equipment, health insurance, etc. (To be precise here, ask your accounting people or CEO what your company’s overhead factor is, and use that number. To calculate pay rate, use annual salary divided by 2000). Your content marketing coordinator also invests about six hours per podcast episode, and an additional eight hours per month on the Fireworks Follies email newsletter to which customers and prospects can subscribe. Her pay rate is $25 per hour, so her monthly cost is $750. You also use an external audio editor to clean up each episode. This contractor charges you $750 per episode. No overhead factor here, because he’s not an employee of your company. Overall, his true cost to the show is $1,500/month. In addition to the labor, you spend approximately $1,000 in social media ads per episode (your coordinator places the ads and makes the creative). You also spend about $1,000 per month on podcast hosting, email software, landing pages, and logo design. (Amortize one-time fees over the anticipated lifespan of the show—in this case, into 12 equal payments. So, if you paid $1,200 for the logo, you’d allocate $100/month each month for 24 hours into your ROI calculation). You also have $6,000 invested into the ebook, and you figure it will be relevant for one year, so you can spread that fee over 12 months as well. Now, you must calculate the return. Let’s assume you average 150 downloads per month of the ebook that stem directly from the podcast. You know this because you use a special tracking URL on the show and on the show recap pages that leads to a landing page where the ebook can be downloaded. You also get 200 new subscribers per month from the podcast to the Fireworks Follies email newsletter. Billy’s sales team is pretty strong, and their conversion rate from a lead (downloaded ebook) to a sale is two percent. Your average customer spends $40,000 over the course of their relationship with the company, and your profit margin averages 15 percent. This means that each customer is worth $6,000 to the organization ($40,000 x 15 percent). Your podcast brings in an average of $24,000 per month in net revenue to the company. That is your return. The next step is to calculate the actual return on investment. This equation is ALWAYS the same: Return minus investment, divided by investment, expressed as a percentage. In this example, it would be $24,000 minus $7,850 divided by $7,850 (24000-7850/7850 = 2.05). The ROI for this podcast is 205 percent. Content marketing ROI calculations are indeed easier for B2B companies, because they almost always have visibility at the transaction layer. B2B knows when someone buys, because there’s paperwork and a sales rep, etc. B2C companies often require some additional finesse to calculate ROI because they don’t have a clean line of sight between podcast listeners and buyers. For example, if the fictional example above was for a consumer-focused fireworks brand like Black Cat, the investment portion would be similar, and the formula itself never changes. The challenge, however, is defining the return. We know that some customers listen to the podcast, but we don’t know what impact that has on purchases. Often, the best way to get at this data and find a relevant stand-in for precise Return is with survey work. Black Cat could survey 2,000 customers every month and ask them two questions: “How much did you spend on fireworks with us last year” and “Do you listen to our podcast”? If you know the answers to those questions, and if you have a statistically valid sample of your customer base, you can produce a data point for the return portion of your ROI calculation. You’d simply determine what percentage of all customers listen to the show, and how much incremental annual spending customers who listen to the podcast produce versus non-listeners. If you have 500,000 annual customers, and two percent of them listen to the podcast (10,000), and customers that listen to the podcast spend $70 more per year than customers who do not listen, the annual return of the podcast is $105,000 (10,000 x $70 x 15 percent profit margin). Once you have ROI for each major content initiative, you can think strategically about where and how you want to spend your content marketing resources. Does the podcast outperform your fireworks webinar series? What if you spent more advertising dollars to get webinar registrants? How would that impact the ROI? What about your series of fireworks demos on Instagram? Maybe you should do more there? These are the questions all content marketers must be asking themselves. Get a weekly dose of the trends and insights you need to keep you ON top, from the strategy team at Convince & Convert. Sign up for the Convince & Convert ONemail newsletter.